DETROIT RUNNER....: It's race weekend for me!!!! Race #2 of the weekend coming up tomorrow. 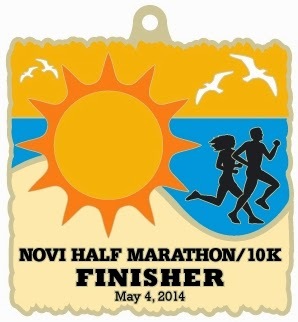 It's the inaugural Novi Half Marathon. This will be half number 24 for me as well as my fourth this year. You all know I'm a huge fan of Kona Running Company so I'm sure this will be another hit race for them. Of course, I'll have my full race review next week and let you know how it goes if you are not running it. The half marathon course looks really nice plus it's flat which I'm happy about since I just ran a really hilly half marathon last weekend. It's also on May 4th so I'm expecting so see tons of Star Wars fans running it for the "May the 4th be with you" theme. Haha! It should make for an interesting race for sure. It also starts and ends on the football field which is always a fun way to run a race. Hope the races went well, mine didn't!! !